The investment team believes our primary job is helping to preserve your retirement savings, and keeping you from having to retire twice. That’s why we draw on the experience of our Chief Investment Officer, Chris Perras, CFA to embed three tiers of protective measures directly into our investment process. We aim to help to guard your investment portfolio against severe periods of market duress, like the crisis of 2008. It's important to remember that no investment strategy will completely eliminate the risk of loss, but we believe that different investment strategies can affect the amount of risk investors take on. What Would You Have Done in 2008? Though some money managers may talk about “what they would have done” during the 2008 crisis, Oak Harvest CIO Chris Perras lived it. As a money manager with Citadel, LLC during the crisis, Chris managed his equity hedge fund to a mere 3% decline for the year, versus -36% in the S&P 500. Additionally, in his twenty-five year career, Chris has been nationally recognized for his skill, managing both the Lipper-ranked Number One and Number Two mutual funds in the country for three and five year performance. We believe that Chris’ experiences clearly demonstrate that he is a highly accomplished and skilled investment professional. 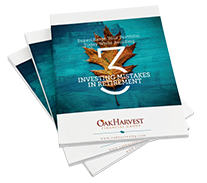 He has put his skills to work for Oak Harvest, leading the Investment Committee in the development of the firm’s equity strategies, and helping the firm to embed layers of risk mitigation measures for your retirement portfolio into our process. The first and most important risk-mitigation measure in helping to keep you retired is the right asset mix for you. How much should you have in stocks? How much in bonds? Are you putting more money at risk than you need to? Not answering questions like these can have serious consequences for your retirement. In contrast, we take the time to understand you and your retirement vision. Our aim is to help you understand how much equity risk you need to take on in the first place. It may be less than you had assumed! In our experience, it may be surprising when you see the custom retirement plan we develop, and discover that you may be able to accomplish your retirement goals without taking on as much exposure to stock market risk as expected. By allocating across the Core4, and taking on the appropriate stock market exposure from the outset, we may be able to help reduce your level of portfolio volatility and overall risk. The second measure we take centers around our stock selection and buying process. CIO Chris Perras has utilized this approach for much of his career as an investment professional. This approach recognizes that everyone in the investment world makes mistakes. Everyone! That’s why we take a very patient and conservative approach. We target purchasing stocks we believe in at relatively depressed prices, over a three to six-month time frame. We believe that rushing into the markets is an easy way to potentially lower your odds of investment success. Our patient approach typically involves investing new client money over a four to six-month period, targeting specific company, sector, or volatility-based opportunities. 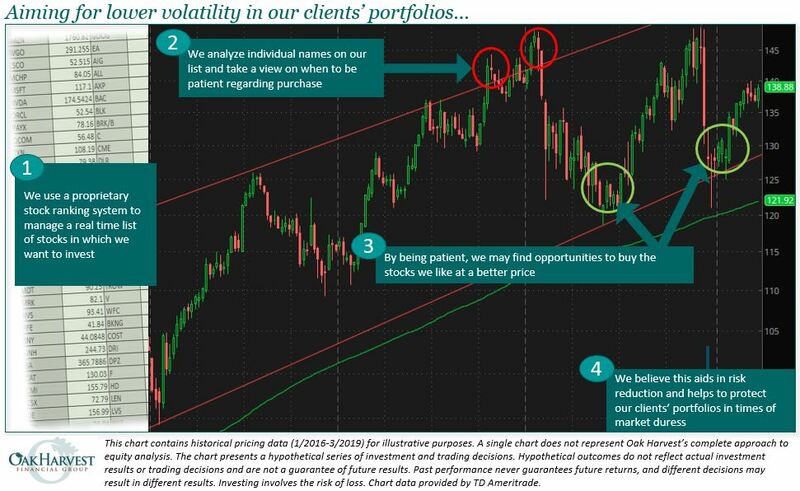 Our central view is that volatility equals opportunity. By investing our client accounts in this patient and value-centric manner, we target providing higher growth potential and less downside risk. The third measure we take to help guard your portfolio involves severe shifts in our long-term market outlook or in global economic circumstances. In the event of a long-term, negative change in the character of risk markets, we may strategically re-position our client accounts away from more volatile assets like stocks, and into less volatile assets like government bonds or cash. As fiduciaries, we place your bests interests at the forefront of our strategic actions. The Investment Committee monitors the markets on a daily basis to help ensure we stay focused on giving our clients the right exposure to risk markets. If we believe a reduction in equity exposure will give our clients higher odds of achieving their retirement goals, we will act. We are confident that our patient and value-driven investment process, guided by the Core4 framework, helps us better manage the assets our clients worked a lifetime to earn. Ready to take the next step? Contact us to schedule an appointment and learn more about our investment approach and how we may be able to help you.